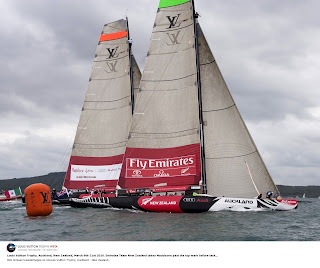 Racing under the colours of the host Royal New Zealand Yacht Squadron, Emirates Team New Zealand won the Louis Vuitton Trophy Auckland regatta Sunday. The Kiwi boat extended on every leg of the deciding five-mile race off Auckland’s East Coast Bays against the Mascalzone Latino Audi team representing Club Nautico di Roma, which is the Challenger of Record for the 34th America’s Cup. Emirates won the first race yesterday, and with their second victory today they went 2-0 in the Finals, which race officials shortened to a best-of-three contest due to light and uncertain winds. Right after the finish, the normally controlled and contained Emirates skipper Dean Barker had a broad smile on his face as he soaked his veteran team with champagne from a jeroboam of Moët et Chandon, not even sparing an event photographer who had climbed aboard for the occasion. On their way to the finals, Emirates survived by one second a heart-stopping last-minute penalty turn in their match against Azzurra, the other Italian team. Today they left no doubts with a composed and clinical performance that only saw them threatened once. The Emirates boat arrived to more applause, flying a gigantic New Zealand blue ensign plus smaller national flags of all the competing countries. Before presenting the Louis Vuitton Trophy, Yves Carcelle, chairman and CEO of Louis Vuitton, congratulated Dean Barker, his team, and all the competing teams on the quality of their racing. “Now I hope the Cup will revive. After the strong south-westerly winds that have characterized much of the regatta and forced the postponement of some races, there was a two-hour wait for wind today as the spectator fleet built in size. Racing started at noon at the mouth of the Rangitoto Channel in a warm and shifty 10 to 12-knot westerly breeze. Barker wanted the right side of the course before the start. Gavin Brady, the Kiwi skipper of ML Audi, wanted the left, and the pre-start was uneventful as they split away, even before they crossed the line. Brady’s tactician Morgan Larson said later that they realized in the last minutes before the gun that the right was favored but they had no option but to follow their game plan. The left finally paid off in the closing stages of the first leg, pulling the visitors back into the game. As they closed, Emirates chose to tack short of the port tack ML Audi, only to be carried out beyond the starboard tack layline by the aggressive Italians. Brady had his opportunity to level the score and the boats were bow to stern as Emirates led around the weather mark. The Kiwi spinnaker blossomed instantaneously in a slick set the Italians couldn’t match. Just as swiftly, Emirates gybed over into the favoring left shift, catching the Italians flat-footed. Within seconds the home team enjoyed a four-boat length lead, one they never relinquished.